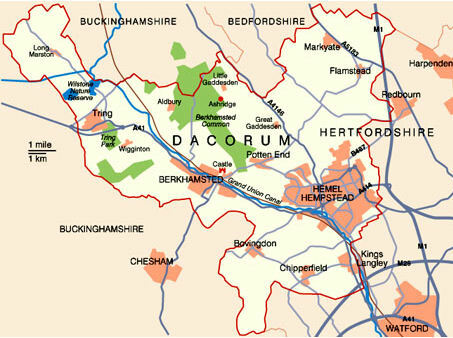 About Dacorum | The Dacorum Heritage Trust Ltd.
What area does the Dacorum Heritage Trust cover? The Borough of Dacorum is situated in the western part of Hertfordshire, bordering Bedfordshire and Buckinghamshire. It covers a diverse area including the towns of Berkhamsted, Hemel Hempstead and Tring as well as many surrounding villages such as Bovingdon, Chipperfield, Flamstead, Kings Langley, Markyate and Wigginton. What does the word Dacorum mean? The word dates back to the Saxon period when a treaty was drawn up between the Danes and the English, stating that the River Lea should be a boundary. A monk writing about this area described it as “the Hundred of the Danes”, using the word “Daneis”. The word was later wrongly transcribed as “Danicorum” and later shortened to “Dacorum”. The current Borough of Dacorum covers the largest portion of the old Hundred of Dacorum. The original Hundred of Dacorum also included places like Aldenham, Bushey, Harpenden, Shenley and Wheathampstead, which are now part of other Hertfordshire districts.